While tech stocks (and plenty of others) continue to consolidate a bit after a steep rally, it is interesting to note that lost in the shuffle of Senate votes, the Dow, Bitcoin, and other issues is the improvement in crude oil. 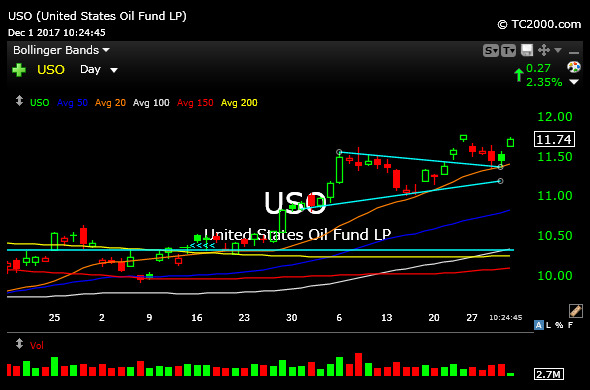 On the USO daily chart, below, which is the ETF for crude oil, we can see the steady progress over the last two months, with some standard backing and filling now threatening to break higher his morning. Recall that crude was mired in a violent bear market for years, with the real downside fireworks beginning in 2014 and spanning a few years after. And, perhaps, the more painful aspect for longs was that crude then went dead after the ferocious downtrend, frustrating those looking for an immediate snap back like equities enjoyed in March 2009. But crude is clawing back now, as are select energy stocks we are now watching closely for Members.